Greetings from the beautiful East Coast! It’s Andy Gesner and the staff from HIP Video Promo, back with a brand new clip from a basement indie-electro duo with a remarkable pedigree. Side-projects are all the rage these days – barely has a band established itself before its main members begin dabbling in offshoot bands. But though Gym Class Heroes synth player Tyler Pursel makes up half of the Pennsylvania-based LadybiRdS, this group is no afterthought. On the contrary – it’s a restoration of sorts, reuniting Pursel with former Ley Royal Scam bandmate Teeter Sperber. LRS played tongue-in-cheek mall-punk, but even then, the strength of the musical relationship between Sperber and Pursel was evident to anybody listening carefully. Regional Community Theater represents the full blossoming of that partnership. Temporarily freed from his GCH duties, Pursel has crafted a set of immediately memorable electropop tracks and gifted them to Sperber, who graces them with her one-of-a-kind, instantly recognizable, candy-cane delivery. Teeter Sperber loves contemporary pop-punk, but she’s a fan of new wave, theater songs, classic hip-hop and R’n’B and Cyndi Lauper, too, and every time she steps to the microphone, all of those influences are apparent. Sperber sings about romance and friendship, but never without wit; she makes clever pop-culture references, but she won’t drop names; she wears her emotions on her sleeve, but she’s got her aces held in reserve. In a genre where vocalists are often defined (and, ultimately, confined) by their diffidence, she’s one of the most likeable frontwomen to emerge in a long time. Sperber and Pursel also have quite an impressive stable of friends and collaborators. Teeter Sperber worked with Max Bemis during the recording of …Is A Real Boy; the Say Anything star returns the favor by lending his voice to two tracks onRegional Community Theater. Fairmont’s Neil Sabatino channels Ben Gibbard on the electrifying “Lady Of Travel And Leisure”, Justin Johnson of the Danger O’s fires up “Shark Party”, and Matt Pryor of The Get-Up Kids lends his own unmistakable pipes to “Cooper, Thanks For The Birds”. But the LadybiRdS’ most favored guests on Regional Community Theater were considerably less heralded: a kid’s choir from a local Pennsylvania elementary school. They join Teeter Sperber on the chorus of “Andy Lex”, and the results are nothing short of heavenly. With its indelible chorus and subtly infectious beat, single “The Brown And Red Divide” has already become a podcast and weblog favorite, and was singled out as a choice cut in All-Music Guide’s four-and-a-half star rave review of Regional Community Theater. In his warm and inviting clip for “Brown And Red”, director Jeff Powers – also a Philly-area artist – emphasizes the quiet camaraderie between Sperber-Pursel. 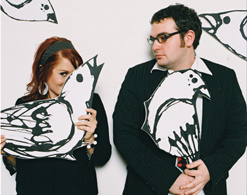 Powers finds the duo in a library festooned with cardboard cut-outs of birds. They’re there to play their song, but they also hold hands and stare at the books, uncover objects hidden in their palms, read, drink a little wine, shoot each other glances, and bump into each other without causing friction. (In one memorable shot, Teeter Sperber appears in silhouette, swinging the cardboard bird and singing into a hand-held microphone.) The choppy, sped-up footage makes it look like the two LadybiRdS are blinking around the room; but there’s nothing modern or slick about the clip. On the contrary, Powers and the band emphasize old things – thick vintage tomes, yellowed sheet music, antique mirrors, life masks. Lyrics to the song appear on invitation cards; one at a time, they’re presented to the viewer like offerings, or love-notes passed across a classroom. It is our true pleasure to have the opportunity to work with the one and only Teeter Sperber herself and also the crew at Creep Records to bring this video to you and your viewers. If you would like copies of Regional Community Theater, give us a shout, because we’ve been hooked up with enough copies for all of your on-air giveaway needs. If you need more info, call Andy Gesner at 732-613-1779 or email us at info@HIPVideoPromo.com.